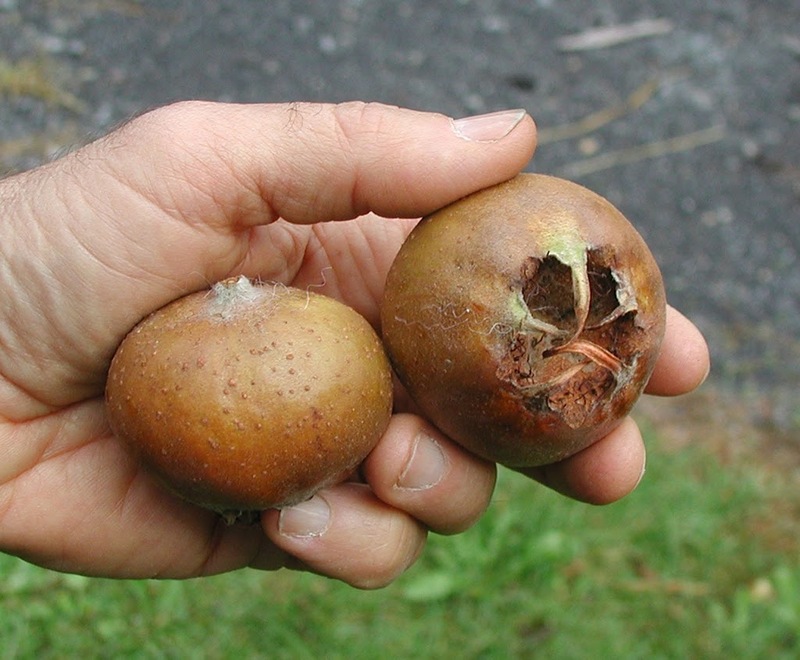 Ugliness, for medlars, is not just skin deep. When harvested, which was a few weeks ago here, the fruits are white and rock hard within, and not ready for eating. The fruit must be bletted, or ripened, a couple of weeks or more. I blet my medlars by setting them on the cool, north windowsill facing my kitchen sink. 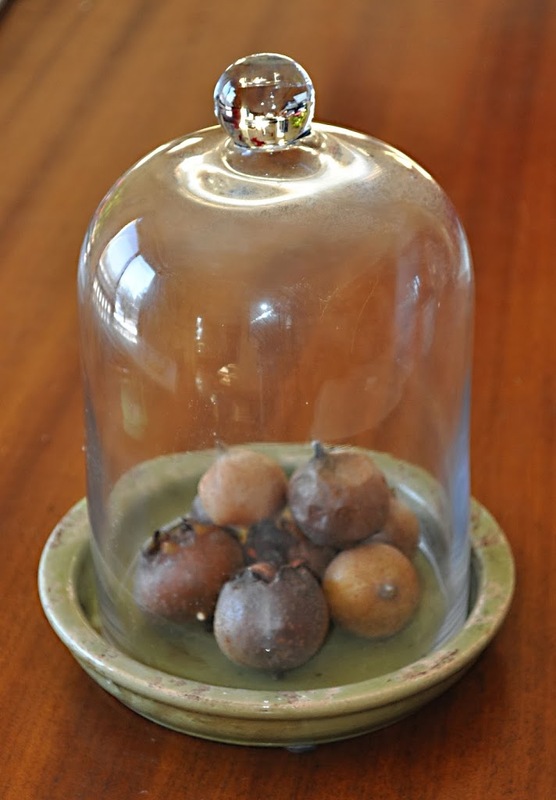 With the woodstove at full tilt, the air at the windowsill might still be too dry for best bletting, so I also have a few fruits bletting beneath a small bell jar in another cool part of the kitchen. A wrinkling, dark skin tells me that bletting is complete. At this point the flesh has experienced a dramatic transformation — to brown mush. 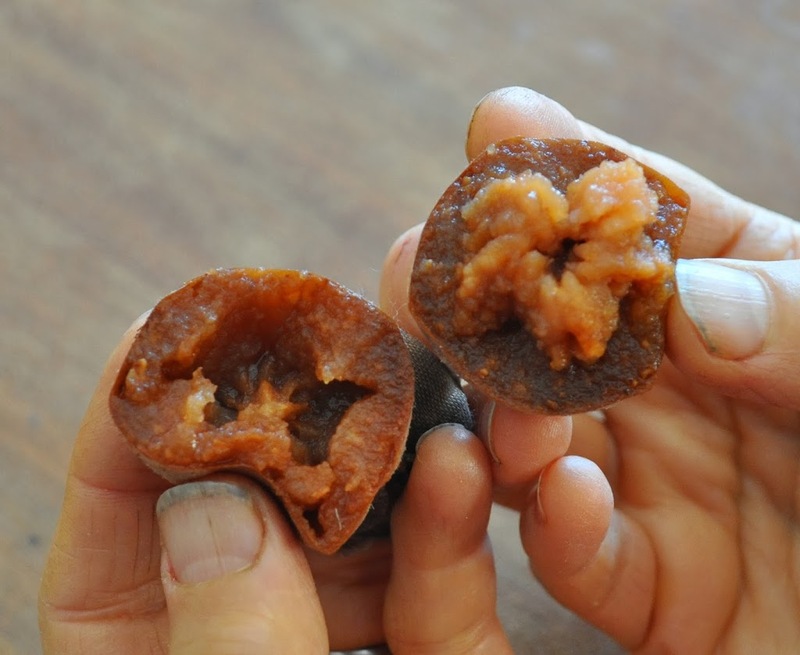 This entry was posted in Uncategorized and tagged blet, easy to grow fruits, fruit pests, medlar, mespilus. Bookmark the permalink. Trackbacks are closed, but you can post a comment. What’s the purpose of the bell jar? To maintain humidity. I’m not sure if it’s really needed, or better. It’s probably not a bad idea if the bletting takes a while and there is dry winter air in the house. Any chance of getting seeds as soon as you open the fruit? I’ve got Royal and Nottingham that were gifted to me grafted onto Marron and need to get them onto separate rootstocks. Ultimately , I’d like to get them onto medlar seedling rootstock. Germination is difficult but maybe I’ll get lucky. Also, do you know of a good supplier of medlar trees? Thanks! I’ve ordered a medlar variety called “Puciomol” from Hidden Springs Nursery that will arrive this spring and I can’t wait. I live in Ohio and have had my share of frustration with apples, plums and cherries. If plums weren’t so good I’d probably have given up already. But I’ve gotten to the point where paw paws, juneberries and gooseberries are the most productive fruits in my garden. I ordered a medlar variety called “Puciomol” from Hidden Springs that will be delivered this spring and I can’t wait to plant it. I live in Ohio and have had my share of disappointment with apples and plums. I agree about the plums. I grow Imperial Epineuse, and when I get a crop, they are the most delicious plums ever. The “uncommon fruits,” though always yield good crops. Except that is not how you harvest/eat a medlar fruit. You wait for the first frost to pick them once the we’re frost bitten, they are perfect, soft, sweet and oh so amaizing!! That’s another way of eating them, which I’ve also tried. I find that they are drier left outdoors. This fruit is very popular and common in fall season in northern Iran region called Guilan Province, next to Caspian Sea. Can the wood of the medlar tree be used for smoking or grilling? I have no idea. But it is closely related to apple and pear. In Cyprus us Turks call this fruit ‘muşmula “. Its a popular fruit people eat it as it comes. I would never have call this fruit or any other fruit ugly. What is know for ZUZULE FRUIT. I had this fruit in Croatia. Small but very tasty. Where did it originated from. Quoting from my book “Uncommon Fruits for Every Garden”: There is some question as to the original home of the medlar, for dense thickets of scraggly and thorny wild medlars now are naturalized over much of Europe. The greatest diversity amongst wild medlars, suggesting a possible point of origin for this plant, is along the west coast of the Caspian Sea. But leaf impressions of the medlar have been reported in interglacial deposits in the former East Germany, lending support to Linnaeus’s choice of germanica for the specific epithet. Hi Lee! Love your work! 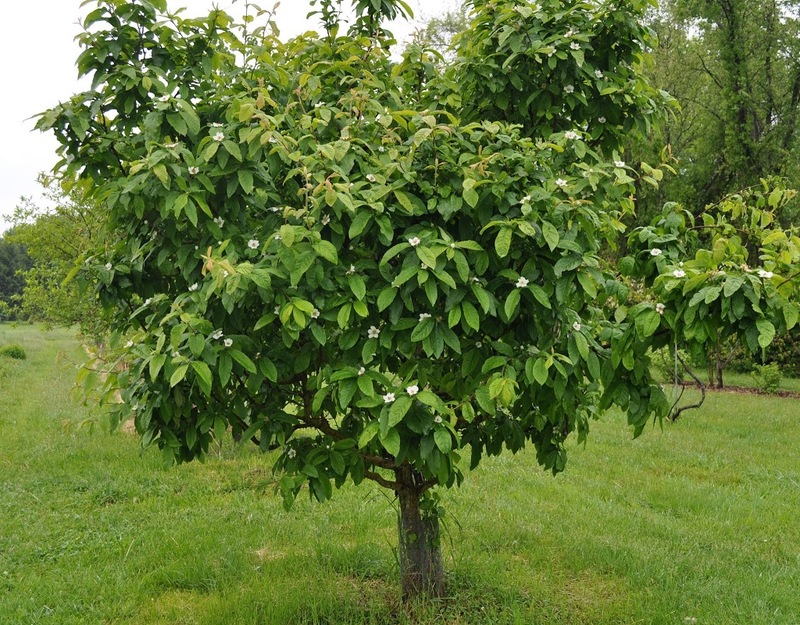 I’m curious if you know if Medlar’s can be planted where we just cut down black walnuts. I can’t find anything on juglone effecting or not effecting them. I have no idea but I expect that it would respond the same as would apple, pear, or other close relatives.